Did you know we can print on all sorts of things? 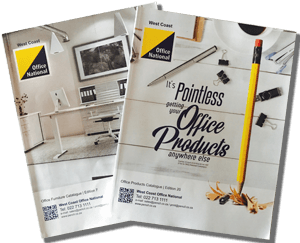 At west Coast Office National our Print department has grown its range of available products. Get all the usuals like Business Cards, Posters, flyers, Plans & Books in a variety of sizes. But perhaps you didn't know we can do all sorts of Labels & Stickers too, including Vinyl & Refrigeration Labels.We are excited to announce that we are now offering custom printed Promotional items ranging from mugs & pens to lanyards & we can even print on Cakes!